Stains are something which do not spare anyone. You wore a beautiful white dress for your anniversary dinner and somehow spilled the tangy red pasta sauce on it or you were out for a wedding in your most beautiful outfit and someone else spilled his drink on your dress. How much we try but somehow or the other we end up messing our favorite clothes. But what to do when your most beautiful dress is stained with that red wine. Well, you need not worry because however impossible it may seem to get rid of those stubborn stains, there always are certain ways out which can help you in removing them. In this article we will talk about different types of stains that our clothes can get and the different ways of their removal. 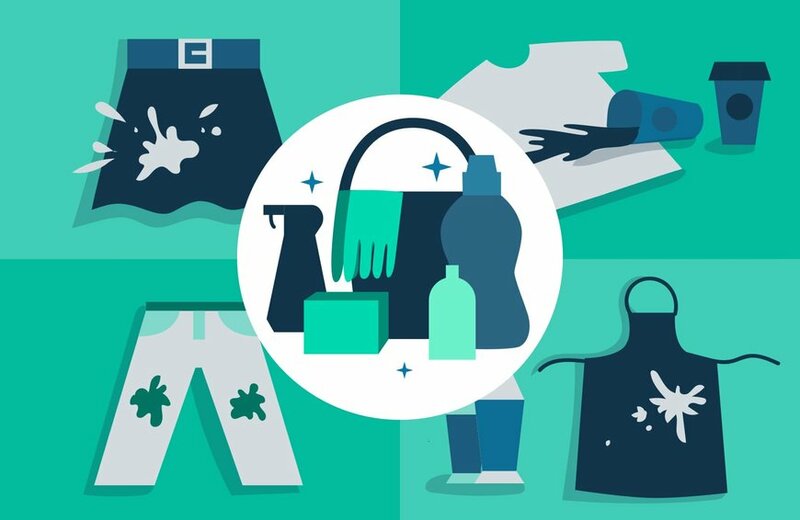 The following guidelines will help you in getting rid of that ink on your jeans or the grass stains on your shorts, you just need to understand what type of stain it is and you can then attack them in the right way. You may also consider to hire a maid if those stains are too tough for you. Before getting into the details of what procedure shall be followed to remove the stains let us have a look on what are the different types of stains. Color Bleed: It happens when you wash a garment of lighter color with the darker colored ones. Color run is one of the most common kind of stain that one gets on the clothes but it can be easily washed away by using oxygen bleach or vinegar. Dye stains: These include all kind of stains which have occurred from the naturally occurring vegetable dyes found in the plants and also include the tea, coffee, ink or stains from any other acidic foods. The dye stains are easiest to remove when they are fresh but they have settled down, it becomes quite difficult to get rid of these. As soon as you get to know about the stain you should run it in the cold water and then wash it in the hottest possible setting of water applicable on the fabric. This will help in lightening the stain and in most cases the stain vanishes off completely. Protein Stains: These are the stains which are organic in nature and constitute of stains from organic matter like vomit, blood or sweat. To treat these kind of stains, we need to break down the proteins with the help of certain enzymes and then dissolve the fats. The enzymes can be found in most of the detergents and hence, these stains are one of the easiest to remove. Combination Stains: These are the stains which are a combination of the above mentioned stained and can occur from the barbeque sauces, crayons, lipstick, eyeshadow, ketchup, hot sauce or any other kind of make- up product. The clothes with these stains firstly need to be rinsed with cold water to remove any excess of the stains and then rubbed with the detergent on the area of the stain. Now when we know what the different types of stains are, we will talk about the normal day to day stains that can be grouped under the above mentioned categories and the various ways to get rid of them. Grass Stains: If you are living in a house full of kids or you yourself are interested in gardening, then the most common kind of stains that your clothes would get are the grass stains. These are a kind of dye stain with a combination of protein and some other organic substances like chlorophyll, carotenoids and xanthophyll. First of all you need to soak the cloth in the mixture of cold water and a product containing enzymes for a time period of at least half an hour in case of a fresh stain and even over- night in case of an aged stain. Make sure not to use hot water as it will lead to coagulation of the protein turning the stain into a one which would be difficult to remove. After soaking, wash them in the usual warm water. Coffee Stains: These are one of the most common stains that occur in every household. It is a kind of a dye stain but the milk or the cream used in making the coffee is a protein. Fresh stains need to be washed with cold water immediately. Next, rub the detergent over the stained parts of the cloth and soak in cold water. Keep on rubbing intermittently and let the cloth remain dipped in the water. After 30 minutes, the cloth needs to be washed in the hottest possible water setting for the garment. Repeat the above mentioned procedure till you see that the stain has been completely removed. If the stain is a little older, then apply white vinegar on the stain and then mix it with cold water. Keep on rubbing the stain with the sponge till it is completely removed. Another alternative can be baking soda which can be applied on the area of the stain with a wet cloth and then rubbed to wash off the stain. Mud Stains: Mud stains are a kind of protein stains which need to be dried before removal. When the stains are dried up, the soil on them needs to be brushed off. Make a solution of 1 tea spoon liquid detergent and 1 tablespoon of white vinegar and add these in warm water. Dip in the stained clothes and let them remain for 15 minutes in the solution. Next they need to be rinsed with water. Let the clothes stand in water for few minutes or till the stain is completely gone. If the stains persists after a long time, then run it with alcohol and then rinse with normal clear water and wash. Other alternatives can be chlorine bleach, if its label says that it is safe to use on garments or enzyme presoak which are known for removing mud stains. Colored Stains: These occur from one or the other kind of color bleed. You can use a packaged oxygen bleach to remove the color stains from your clothes. This product produces oxygen bubbles on being mixed with water which makes it very good in removing stains. The directions to be followed are mentioned on the package but before applying it you should always test it on a smaller area of cloth. If all is going well then you can soak your clothes in it and then thoroughly rinse to get stain- free clothes. Sauce Stains: Be it the barbeque sauce or the normal tomato ketchup, the sauce stains are one of the most difficult to get rid of. These are a kind of combination stains and can be removed by soaking the garment in a mixture of half teaspoon of liquid hand detergent, 1 table spoon of vinegar and cold water for about thirty minutes and then rinsing it. If the stain persists, then pre wash the cloth with the pre- wash stain remover or a powdered detergent and water and then wash in warm water. Let it dry. If the persists even now, then the cloth needs to be soaked in an enzyme product from an hour to over night and then laundered in warm water. Make sure not to use hot water or hot air for drying before the stain is removed, as they will make the stain permanent by letting it settle down on the garment. Stains on white clothes: Be it any kind of stain, the removal of it from a white garment is a challenging task. The stains on white clothes tend to remain prominent and making them vanish completely becomes very difficult. The stain needs to be removed as early as possible in case of whites. Scrape off food items or any remnants of the stain causing agent and then rub the stain with a liquid detergent gently with your fingers. Make sure not to use a towel or any dark colored cloth as it will make the stain darker. The garment then needs to be soaked in cold water for 15 minutes before being washed. The best agents to removes these stains are either baking soda or corn starch. Gently rub them on to the affected area with a cold wet cloth. Other alternatives like hydrogen peroxide or white vinegar can also be used to get rid of the stubborn stains on the white garments. All in all the removal of stains is a tough task and needs patience along with agility. The earlier you catch a stain and the sooner you take action against a stain, the better are the chances of it being removed easily. So, as soon as you spot a stain, without any delays take the appropriate action that is required in its removal. The above mentioned tactics have time and again proven to be quite successful in vanishing the stains completely. So follow them and you will again be able to wear that once stained and now spotless favorite dress of yours.